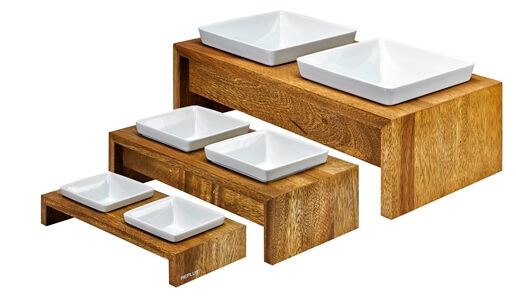 Make mealtime a little more civilized with the right bowls and placemats! A bowl that will last doesn’t have to look unpleasant, and a quality mat can prevent messes and help to maintain a tidy look throughout your home. You can find the right look that matches your dogs personality as well as your own. Our slow-feeder bowls, for example, help curb speed eaters and eliminate choking hazards and bloating. We recommend you avoid plastic bowls for everyday use, as they can hold bacteria or leach toxic plastic plasticizers and colourants into your dogs food. We also recommend you store your dogs food in aluminum or metal tins, never plastic. So make sure you buy a ceramic or stainless steel bowl. We have a wide selection that even extends to BPA-free travel bowls for water on the go. Chomping at the Bit? Visit Us Today! Whether you are just curious about the types of bowls and placemats or are in desperate need of one, we have the perfect one for you. Be adventurous and try something new or stick to a trusty classic design; the choice is up to you. Stop by our location in the Beach and see just how much fun shopping for your dog can be!